What are the Picture Props? 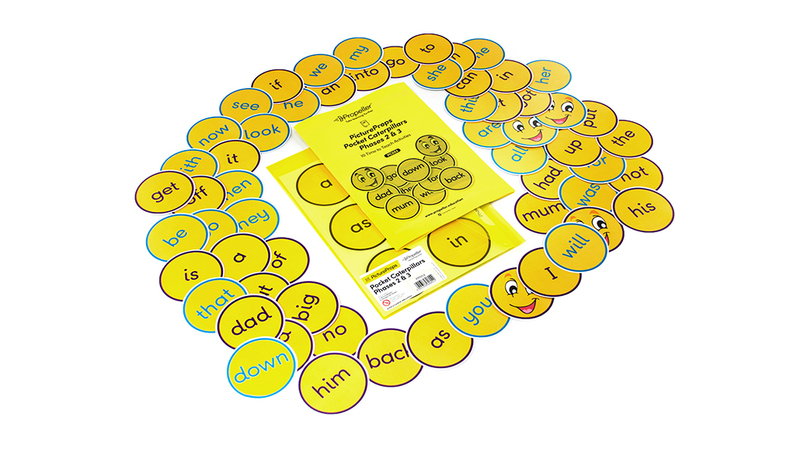 The Picture Props packs are themed packs with pre-cut pictures or text bubbles, with words relating to the Letters and Sounds document. The pre-cut pieces are printed on both sides with space on one side for your own words/numbers/prices. Each Picture Props set comes with a “10 Time to Teach Activities” booklet, which gives helpful suggestions for lesson ideas using the Picture Props packs. Each activity has clear National Curriculum objectives stated so those referring to the booklet know exactly which objectives an activity would cover. Remove the pre-cut printed sheets from the yellow wallet. Before first use of the pack, gently push out all the printed shapes from the pre-cut template. Refer to the “10 Time to Teach” activities booklet for ideas for lesson plans/activities and National Curriculum references if necessary. Decide whether to use the printed side of the Picture Props cards, the blank side and add your own prices, or a combination of the two. 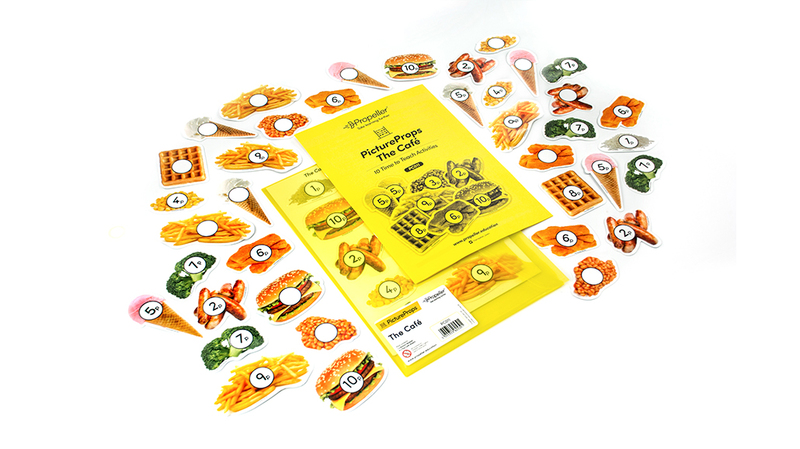 After using the Picture Props set, they can be stored easily and conveniently in the yellow wallet along with the 10 Time to Teach activity booklet. We have printed the booklet on yellow paper so that it stands out when placed on a busy desk! A set of five sheets of pre-cut food related pictures. These are double sided. One side has prices printed on, the other is blank for you to write on your own prices using a drywipe pen. The Snack Pack contains pictures of fruits and vegetables, whilst the Café focuses on items commonly purchased in cafes/restaurants. They can help children to become more familiar with totalling amounts, giving change etc. Picture Props can be used in whole class or small group settings. Picture Props sets are great for using in a whole class or small group situation to increase confidence and familiarity when working with money. These are sets of words taken from the Letters and Sounds document and grouped together. They can be used for displays, working walls and for daily practice of common words. Regular reading practice of these words can be easily incorporated into a class daily routine using these bright and clear cards. The Pocket Caterpillar words can be used in small group situations or whole class work to increase confidence and familiarity when encountering these words and adding them to sight vocabulary.